In this article, we explore what is an acceptable waiting time for a contact centre. As discussed in our article “What Are the Industry Standards for Call Centre Metrics?“, the traditional wait time for contact centre customers is 20 seconds. In fact, it is conventional for contact centres to aim to answer 80% of their calls in 20 seconds. But should we perhaps start to think about shortening or perhaps even lengthening this wait time? Let’s investigate this further, to help you find the ideal wait time and service level for your contact centre. Should Wait Time Vary From Industry to Industry? Despite the “industry standard” of answering 80% of calls in 20 seconds, this wait time may not be applicable across all industries. Customers of one product/service may be more willing to wait longer than others. 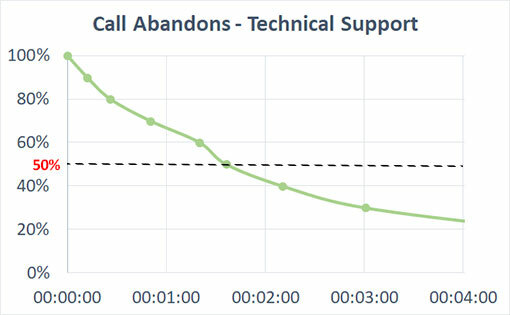 In our article “How to Bring Down Your Call-Abandon Rates“, we compared the abandon rates at a sales contact centre with those at technical support contact centre. The results are highlighted in the graphs below. In this contact centre, over 50% of callers abandoned after 45 seconds of waiting. In this contact centre, over 50% of callers abandoned after 95 seconds of waiting. What Do Your Abandon Rate Metrics Tell You? As evident from the two graphs above, your abandon rates may help to inform you when is best to set your target wait time. In fact, some contact centres like to set an “abandon ceiling” at somewhere between 3% and 5%. Once decided on a percentage, you can deduct an appropriate queue time from that, specific to your customer base. 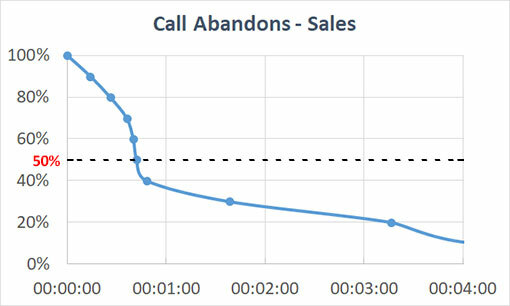 You can do this by plotting your percentage of abandoned calls against time – like in the graphs above. Some contact centres like to set an “abandon ceiling” at somewhere between 3% and 5%. Once decided on a percentage, you can deduct an appropriate queue time from that. So, if you chose 5% as your “abandon ceiling” you can find the average time when 95% of customers are still waiting in the queue. Kevin McAteer, one of our readers, also believes that the key to finding an acceptable wait time for your contact centre is in your abandon rate metrics. However, you also need to factor in Customer Satisfaction (CSat). Look to see if there is any correlation between CSat and wait time, by plotting the two metrics against one another on a separate graph. 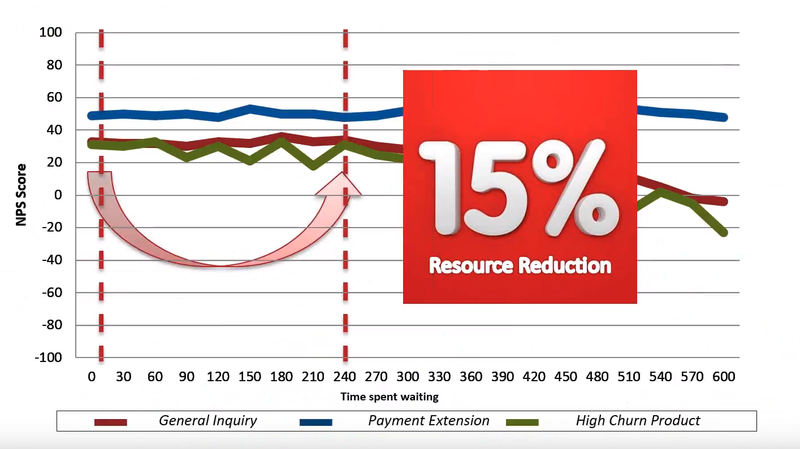 If you find CSat is higher when queue time is based on an abandon rate of 3% instead of 5%, reduce it further. However, if the difference is minimal, it might not be worth the extra resources required to meet that service level. For more on this topic, read our article: Is There a Correlation Between Queue Time and Customer Satisfaction Levels? 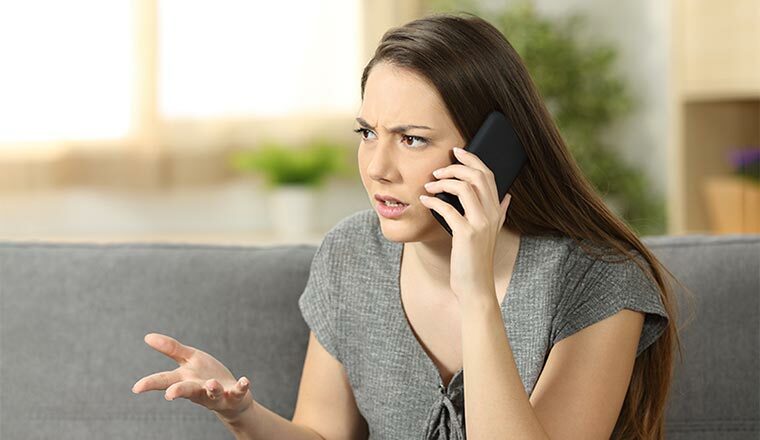 Some organisations use customer service as a competitive differentiator, and if you belong to such a contact centre, you may want to consider shortening your hold times. It all depends on what image you want to give to your customers and whether you want to differentiate yourself from the competition through service. So, if you are part of an organisation that prides itself on outstanding customer service, consider lowering wait times from the conventional 20 seconds. Or, if you use abandon rates to deduce a wait time, consider lowering your abandonment rate “ceiling” to below 5% and find your new wait time in that way. So, that’s the case for shortening queue times, but why would you consider relaxing them? The obvious benefit is to save resources, but some also believe that it could be in the best interests of the customer. 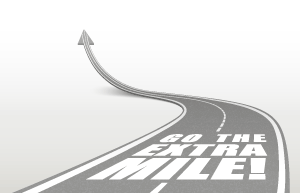 While this may sound counterintuitive, doing so can relieve the strain on advisors and encourage them to go the extra mile for the customer. While this could offer some organisations plenty of savings in resources, many would question whether it damages customer service by increasing abandon rates. However, Stuart is a fan of reducing abandon rates in other ways. 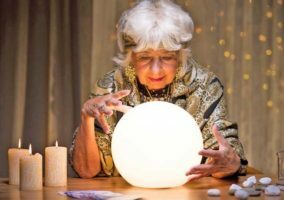 While many will still question whether lengthening wait time is in the best interests of the customer, research from Vocalabs indicates that longer wait times have a minimal impact on CSat, as long as they aren’t too long. In fact, Vocalabs’ survey into contact centres in the banking industry found that customers were willing to wait for up to 2–3 minutes and that CSat was not significantly impacted until wait time surpassed 4–5 minutes. These findings have been backed up by an Australian contact centre, which decided to prolong its wait times massively, from <15 seconds to 240 seconds. In doing so, it saved 15% in resources and saw no negative impact on its NPS scores, as highlighted below. Adding flexibility to contact centre wait times has another benefit of ensuring high-value calls are answered more quickly than others, according to Stuart Lambert. If your contact centre segments its customer base into high-value and low-value customers, having different wait times and routing strategies is an interesting idea. As always, the key here is to try to match your level of service with the overall experience your customers expect. Decreasing wait times for high-value customer is certainly an interesting approach to take. What About Channels Other Than Voice? 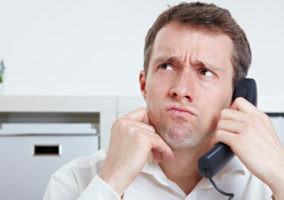 Wait time does not only apply to inbound calls. However, for live chat – another channel where the customer has to wait in a queue – the same principle of setting a target wait time that is based on abandon rates applies. For other channels, such as email, letters and social media, a delayed response is to be expected. This delay will likely vary across different industries, though. So, we’ve done our research and found service levels across these three channels, which seem to be the average across different industries. Relaxing service levels seems to be ideal in terms of resourcing, while not significantly impacting customer satisfaction. However, there is a risk of increasing abandon rates, which may impact satisfaction in an unmeasurable way. Option 1: Stick to the traditional 80/20 measure – It’s conventional for a reason, right? Option 2: Use your abandon rates to guide you – Deduce the most appropriate wait time from when a certain percentage of callers are still on the line. Option 3: Relax your service levels – Perhaps stretch to 80/50 or 80/60, as long as you are confident you can reduce abandons in other ways, e.g. offering call-backs and using engaging IVR messages. 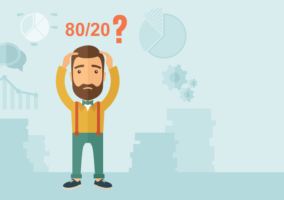 Is 80/20 Still a Reasonable Service Level?